Close up of perfect Staghorn Sumac berries (called drupes) on this cluster (called a panicle) ripe for picking (which I did with this one). Staghorn Sumac (Rhus typhina) and the Smooth Sumac (Rhus glabra). The berry clusters are beautiful to look at, and actually make a nice drink. Like anything you have never had before, make sure you have very little at first to make sure you aren't allergic. It doesn't matter which one - the Staghorn or Smooth Sumac, as they are the same from an eating perspective. This is a well regarded ornamental, and there are different cultivars of it available at nurseries. You can also start it by seed or transplanting a small one. 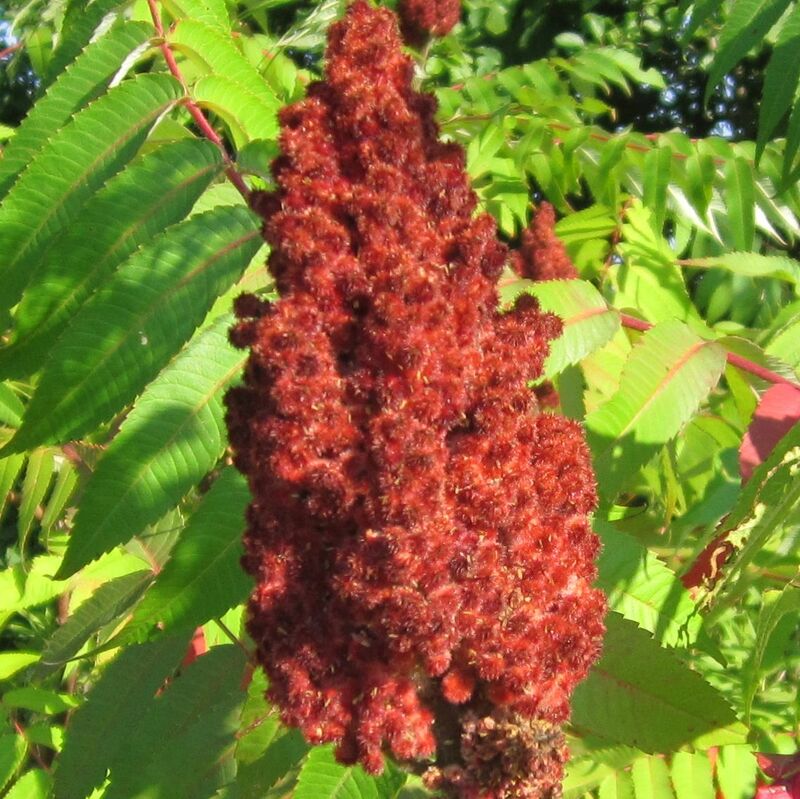 Seeds: You can start a Sumac from seed, but it is not just planting it in the ground. You have to either cut the hard shell without damaging the seed inside, or bring a pot of water to a boil, turn off, toss the seeds in, and leave until the water cools. Next, take the seeds and mix with some damp but not wet peat moss and put in a sealed freezer bag in the fridge - not freezer. Leave for a month or so. After, plant the seeds 3mm (1/8 inch) deep in a pot with potting soil, mist it until it is moist, cover with a clear plastic bag and put a rubber band around the bag and pot to seal in the moisture. Put the pot in a warm area away from direct sun. Once they have sprouted, take off the bag and mist to keep moist and grow in a bright, but not direct burning sun spot. Transplant in the spring into the ground and keep moist for the first season. Part sun, part shade would be best, but if no shade where they are transplanted to, cover them from direct mid-day sun after transplanting. A plastic chair over them would do well and let in the morning and evening sun. Transplanting: Transplanting is straight forward. 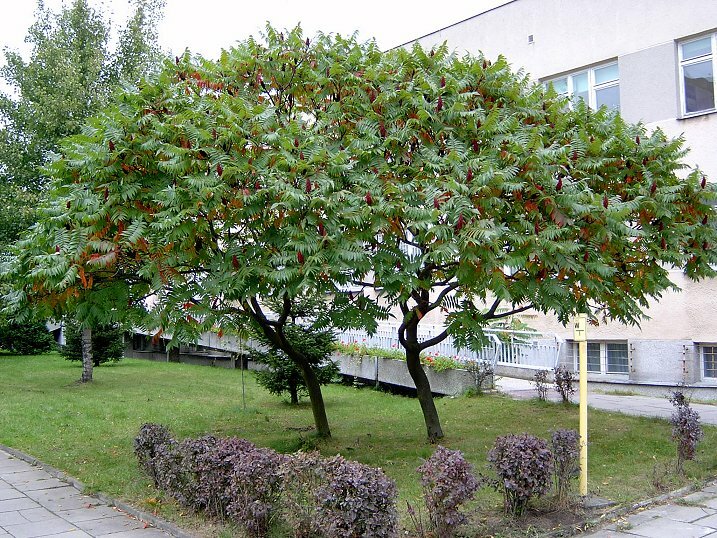 Try to get as big diameter around the Sumac as possible. Don't transplant very little ones, or really large ones. Between 60-100 cm (2-3 feet) high is about right. The roots are shallow, so 20 cm (10 inches) deep is good enough. Most likely the one you transplant will be a root sucker from a larger one nearby, so cut that root as far from the one you are transplanting as you can. Put in a hole and cover with the soil from the hole mixed with composted manure or compost. Cover around the new tree with about 5-7.5 cm (2-3 inches) of mulch. Water well and keep wet for the first year if done in spring. If done in the fall, water well after planting, and the next year don't let it dry out. Soil & Site: If you have alkaline soil, your better bet is the Smooth Sumac. Both can do well in soils that are a little acidic to neutral. They like full sun, but can do fine if they spend some of the day in shade. The best soil is rich in organic matter, well drained and moist. After planting, cover the ground with mulch to help keep the soil moist. 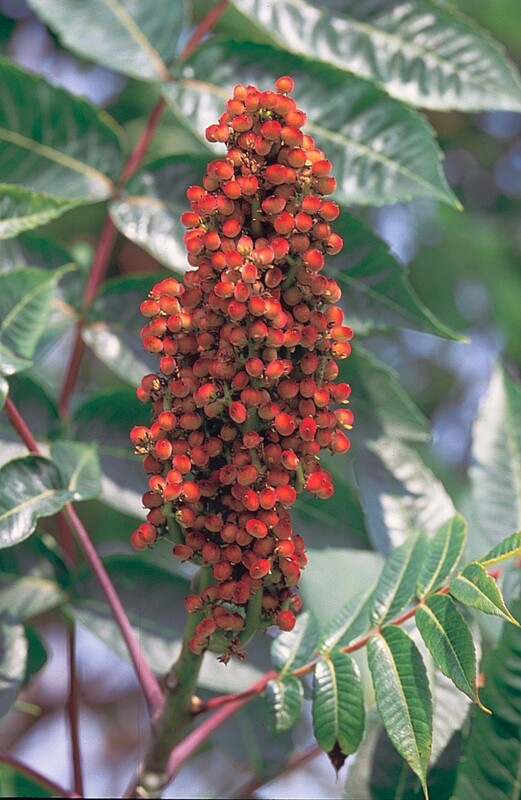 The Smooth Sumac is also the better choice for drier conditions. Maintenance: This plant will spread readily by the roots and can take over an area by forming clonal colonies. If you plant in an area where it is mowed around, this will keep it in check. Add some mulch around them each fall - leaves from the rest of the surrounding yard is a great way to get rid of them and mulch these. There isn't much else to do for them. Harvesting: In the late summer to early fall the clusters of berries will be bright red and ready to pick. Cut below the cluster with a sharp knife, pruners or sharp, strong scissors and take inside to use. 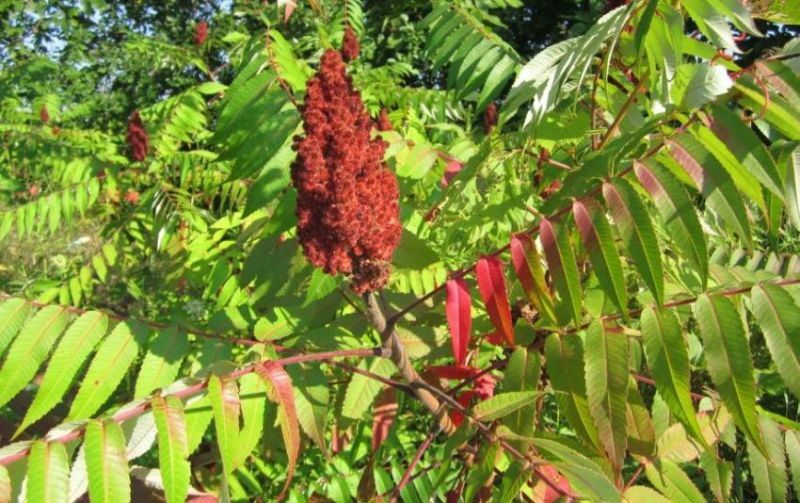 Using: When the Staghorn and Smooth Sumac berry clusters are ripe, pick two or three clusters off the plant, take home and remove the outer, healthy looking berries into a bowl, pour warm, but not boiling water over them. Rub the berries around with your hands, then let soak for about half an hour. Take the mix and pour into a clean coffee filter over a pot, or through a clean and well rinsed tea towel. Put the pinkish red drink in a fridge to cool, or over ice to have right away. Keeps for a day or two without a problem. This drink cuts thirst better than almost anything else. If you find the mix you made too sharp, just dilute with cold water. 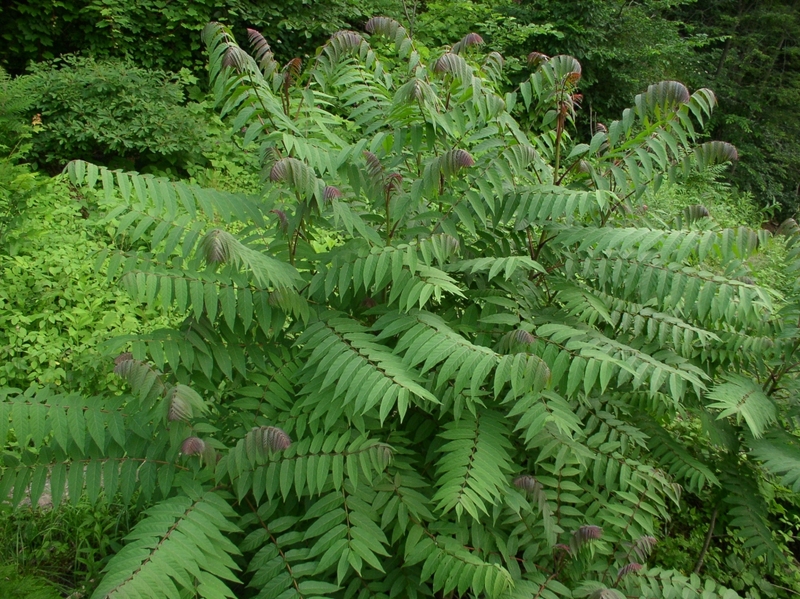 Make sure you know what a Poison Sumac (Toxicodendron vernix) looks like. 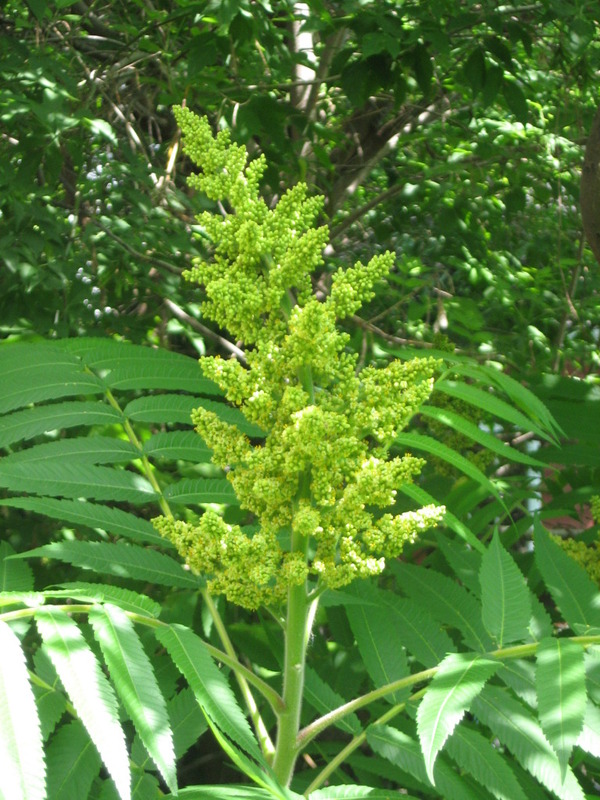 The leaves are similar looking to the Staghorn Sumac, and especially the Smooth Sumac at first glance - they are compound leaves. To be safe, DO NOT touch a Sumac unless you see the red berry clusters like in the included picture below. 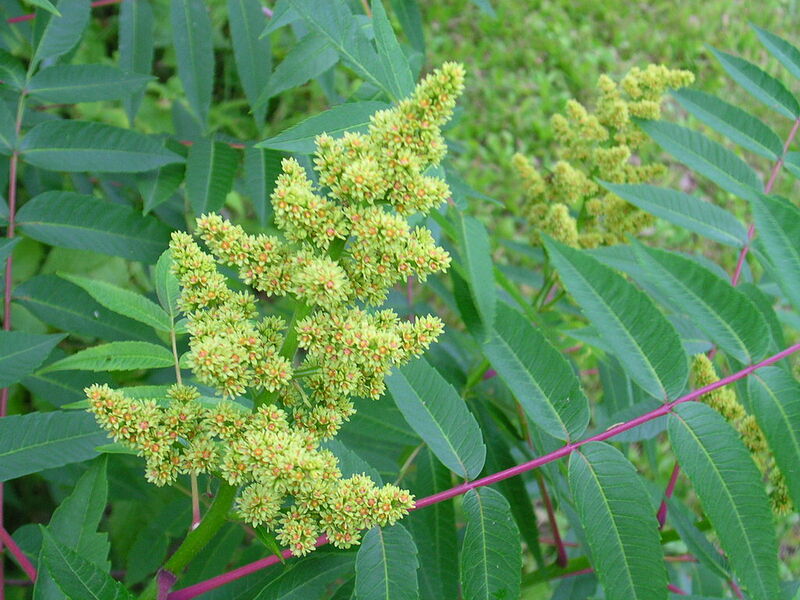 The Poison Sumac has white, green or grey colored berries. The Poison Sumac likes very damp or wet land. The Staghorn and Smooth Sumac likes well drained hilly areas, though they are often by water - just not in standing water or soaked land. Don't bother with anything that looks like a Sumac if it is damp or wet in the area until you see the red berry clusters. 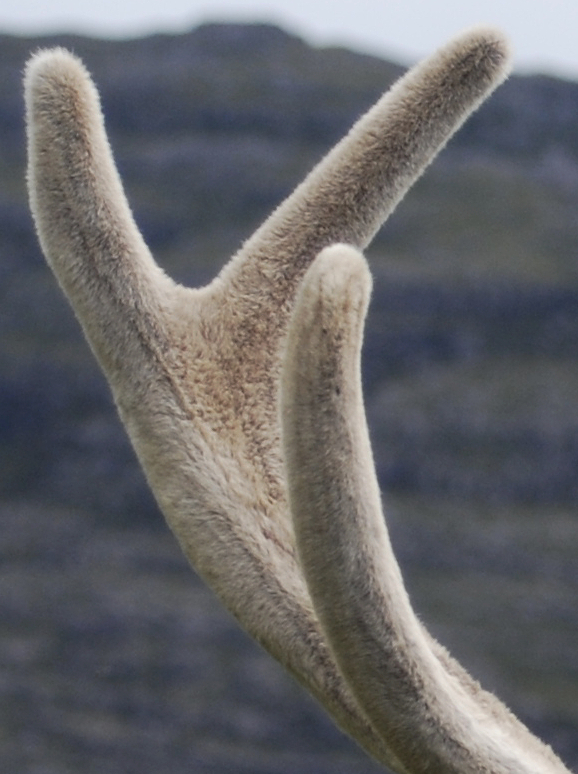 Habitat: Dry soils, edges of woods, abandoned land, waste areas, very often on the sides of hills forming clonal colonies from spreading by the roots. Can tolerate very poor, dry soils. Often found on sandy soils by rivers, but rarely where the soil is always wet. Staghorn Sumac (Rhus typhina) range. Distribution map courtesy of the USGS Geosciences and Environmental Change Science Center, originally from "Atlas of United States Trees" by Elbert L. Little, Jr. .
Staghorn Sumac (Rhus typhina) with drupe panicles (berry clusters) ready for harvest. These were found mid August, and are usually good right into late September. USDA Plant Hardiness Zone: 5-11 (More information on hardiness zones). Leaf Size: The compound leaf is up to 50 cm (20 inches) long, each leaflet is 5-11 cm (2 to 4 1/3 inches) long. Lower side of leaf is whitish, while upper side is green. Bark: Smooth, grey to brown. Habitat: Dry to moist areas, tolerates a very wide variety of soils including fairly high alkalinity compared to other Sumacs. Will form clonal colonies. Smooth Sumac (Rhus glabra) range. Distribution map courtesy of the USGS Geosciences and Environmental Change Science Center, originally from "Atlas of United States Trees" by Elbert L. Little, Jr. .